Up-and-coming Brit producer says goodbye country, hello nightclub on an excellent, if overdue, debut album. In 2003, a little song hit the UK called “Destroy Rock & Roll”. It was by an unknown producer who called himself Mylo and it featured the perfect combination of killer bass line, addictive squelch-beat, and suitably whimsical vocal -- in this case, a sample of a conservative politician on an anti-rock rampage, mis-pronouncing famous rock acts (“David Boo-ey”, “Cindy Looper”). The song got played, then played out, and if that was all we got, you might well have shrugged off the name ‘Mylo’ along with the hundreds of one-act DJs that come and go every year. Forget that -- for one, the reworked version of the song that makes an appearance on Mylo’s debut long-player proves this guy’s serious about production: the new version is turned all dance-out fun-frenzy and, almost three years after it was released as a single, now feels refreshing, like an old friend, when it pops up mid-album. That’s Mylo’s triumph on his excellent debut, Destroy Rock & Roll: catchiness without flippancy. And overall -- jokes on the title aside -- Mylo’s debut album rocks. It’s confident and smooth, fun and sophisticated, but not demanding. Finally released in the U.S. over a year and a half after it hit stores in Europe, the debut comes as one of those LCD Soundsystem-esque latecomers, less a debut than -- with four successful UK singles and inclusions in many of the big commercial mix CDs -- a greatest hits compilation. Most obvious, especially on the album’s casual bookends, is Groove Armada. The opening and closing tracks are downtempo and jazzy, the repeated grooves triggering bliss without reference to the foot-shuffle mayhem to follow. This is reflected especially on “Sunworshipper”, which is pure Vertigo-era Groove Armada, all laid-back, treble-heavy synthetic clap and stall-beat. The vocal clip is perfect for the music’s texture, all new-world-charm ("I took off on my bicycle) inviting the listener on an easy come, easy go journey. “Guilty of Love”, 0:51: the choppy string arpeggios cut away, replaced by bouncy summer groove-along. From there it’s all simplicity and stupidity and fun, with a little rattled nonsense-sound thrown in between a wobbly major synth melody and a chugging treble beat. “Drop the Pressure”, circa 2:45: the vocal keeps rising and rising, until you hear it break into a simple embellishment and you can’t wait for it -- brilliant. There are plenty others, too. “Otto’s Journey”, “In My Arms”, and “Paris Four Hundred” are all taut, ably-produced head bobbers, efficient and effective. “Doctor Pressure”, the sanctioned mash-up of Miami Sound Machine and “Drop the Pressure” is a take-it-or-leave-it addendum, doing well on the UK charts sure, but truth be told, Mylo’s track stands fine on its own. 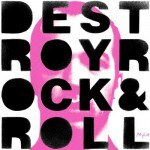 On Destroy Rock & Roll, Mylo hasn’t made the crossover hit of, say, You’ve Come a Long Way, Baby; and at the same time, Mylo’s less inventive, and therefore requires less of his listeners than an act like Basement Jaxx or Felix da Housecat. But that’s fine. Buy Destroy Rock & Roll not to study, but to enjoy, to pump you up for going out, or just as the soundtrack to your everyday life. And each time “Drop the Pressure”, or “Guilty of Love”, or “Otto’s Journey” comes on, just go crazy. P.S. Rumor is, Mylo’s live shows with full band are pretty special. Though he’s been forced to cancel the planned U.S. tour due to the very un-rock & roll reason of an ear infection leading to hearing loss, I for one will be looking out for him when he does make it here.